We are working hard through our number sense unit this month. We have covered rounding, comparing numbers, and using base ten blocks through the thousands. This week we are working on 10 more, 10 less, 100 more, and 100 less up to 999. Yesterday we began with 10 more and 10 less using a hundreds chart. We started with two digits numbers and then moved to three digit numbers. This mini unit has a set of task cards with recording page and 7 printables. If you aren't sure about purchasing the unit, download this one page freebie which is similar to what is in the packet. 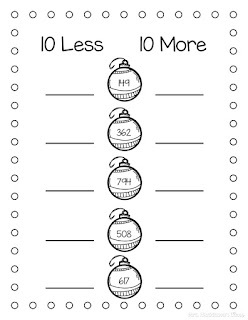 This will finish up our number sense unit, just in time to take our second quarter math assessment and have a couple of fun math days before Christmas break!